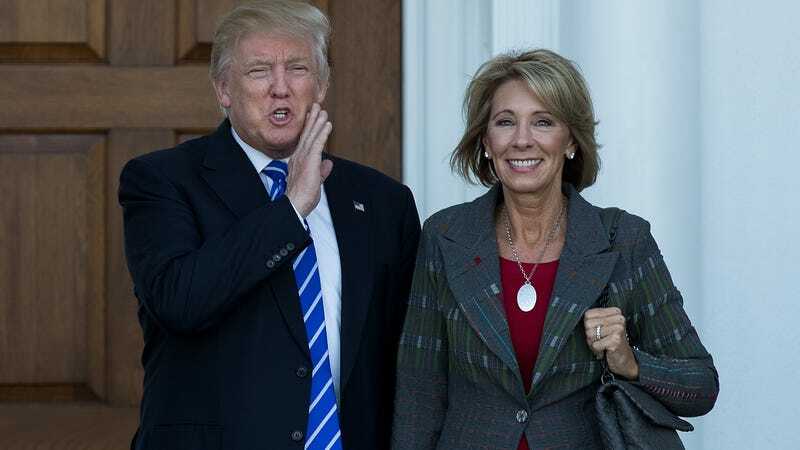 Betsy DeVos is very, very bad at her job as President Trump’s Secretary of Education, but that’s okay because she’s also very, very rich, with ties to totally on-the-up institutions like multilevel marketing cult Amway and Blackwater, a mercenary training camp. We learned a bit about her ten—yes, ten—yachts recently when one was hilariously set adrift on Lake Erie, and now we’re being treated to a look at her Michigan summer home. Thankfully, that look is coming courtesy of Kate Wagner, a student of architecture who’s provided endless amounts of joy to us normies who don’t require our own castles by mocking the impractical abodes of the rich and famous on her popular McMansion Hell blog. In a guest column for Vox, Wagner shows us there’s plenty to hate on DeVos’ vast property. DeVos’ residence is a sprawling, “shingle-style” house that, according to PriceyPads.com, packs 10 bathrooms, three kitchens, eight dishwashers, 13 porches, an elevator, and, for some reason, just three bedrooms. It also, according to Wagner, has 13 different window styles, three separate roof types, and a marked lack of consistency throughout. Over at Vox, you can see that cursed turret, as well as Wagner’s search for a front door, her musings on rich dogs, and the influence of Victoria’s Secret dressing rooms on the garish decor.